Cumbia beats could be heard from inside El Centro, where kids, teens, and facilitators played a speed round of lotería to start their day. The group is part of Escuelita ​— ​“little school” in English ​— ​which opens its doors to neighborhood kids Monday, Wednesday, and Friday on Santa Barbara’s Westside. 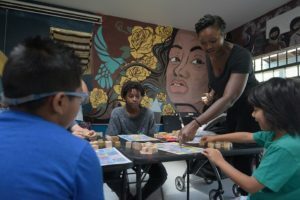 Open to ages 5 and older, the free summer program, modeled after the Freedom Schools of the civil rights movement, is run by El Centro volunteers and teen interns. “We value intergenerational knowledge,” said Simone Ruskamp, an El Centro boardmember. “It gives [Escuelita] a lot of life.” The program is very popular for many Westside working parents who can’t afford to send their kids to summer camps, added Boardmember Nayra Pacheco. Escuelita provides neighborhood kids and teens with culturally relevant activities and ethnic-studies teasers. “One of our goals is to create living libraries in our neighborhoods,” said Ruskamp. Earlier in the week, a capoeira workshop was organized by a neighbor, she said, “and he talked to the kids about Afro-Brazilian resistance.” The campers have also learned about the Chumash resistance closer to home. “I have a lot of favorite moments,” said 11-year-old Karla. “We learned about the Chumash, and we get to make a lot of things and take them home.” This coming week, Karla and another camp member, 10-year-old Vanessa, will lead a workshop of their own. “We’re going to teach everyone else how to [make] slime,” they said. Since Escuelita is offered for free, El Centro is seeking contributions to help cover operating costs. Visit gofundme.com/escuelita-2018-el-centro.